If you are 16-24 years and would love the chance to make a difference to the lives of patients in hospital then you could sign up to be a Pears Youth Volunteer! My journey into NUH Youth Service started when I was 12 years old. Back then I was a socially awkward boy who would rather tackle someone on a football pitch and take their ankles out than speak to someone and have a conversation; oh how times have changed! Now I am a 22 year old young man who has two part time jobs, one of which is in a youth work setting and I can talk for England…to anybody! Now I bet you are thinking that is quite a change within ten years and I would agree with you and it’s all thanks to the wonderful NUH Youth Service and their continued support. As I have said I came to a youth club session when I was 12; the honest truth was it wasn’t for me back then I really wasn’t someone for meeting new people and making friends quickly. Five years later at the age of 17 I decided to come back and if I’m honest I’m not quite sure what made me come back at the time but honestly it was the best decision I have ever made! I got involved in all aspects of the youth service from the youth club, Lego group, skills for life sessions, youth forum and young adult group. This time not only did I make friends but I met friends which I’m pretty sure will be lifelong friendships! Also thanks to the youth service I have had lots of training opportunities that I know I would otherwise not have had. I have been fortunate enough to experience going on some very exciting trips and residential holidays. These have really helped me gain valuable life skills and experience new activities that I’ll remember for the rest of my life. My first time going to Wales, which is an annual trip we do every year, will stay in my head forever. At this point I was still a young person who was experiencing going away without their family for the first time, I don’t think anyone could tell because I had the time of my life and felt very comfortable around everyone. In 2017 the Youth Service gave me the opportunity to do a youth work course and become a peer mentor. This was a very exciting opportunity for me as I had previously expressed my desire to them about eventually wanting to begin a career in youth work myself. Through the youth work course I got to learn all about the different theories behind youth work and learn all about reflecting on your practice and generally get a better understanding of what youth work is all about. The Youth Service has given me a lot of confidence to go on to achieve a lot of what I have done today. In November of 2017 I had the honour of receiving The Leckie Award of Achievement which honours a young adult who has moved into the adult’ services from the children’ services within the hospital, I found this very humbling. 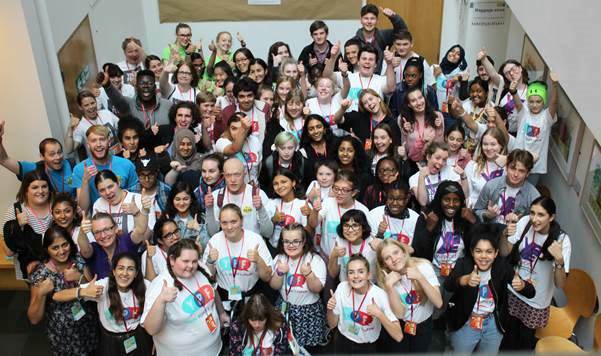 Also earlier in that year, again thanks to the Youth Service, I got to do a presentation in front of 130 nurses and other medical professionals explaining what the youth service is all about and how it helps to support young people, this was a huge honour and quite a big learning curve for me as I realised at that point that ‘I can’! Since doing the youth work course my confidence has gone from strength to strength and I have really enjoyed moving up from peer mentor to volunteer this past year. During 2018 I have experienced my first full year of being a volunteer and have very much enjoyed the experience and having the extra responsibility that came with that. The NUH Youth Service has supported me so much over the years, in parts with my own medical condition but in the main helping me to see that ‘I can do’ anything I want to if only I just try, for this I can’t thank them enough! I wouldn’t be in the position I am in now if it wasn’t for them and I now proudly say to all who will listen that I am too a very active (and talkative) part of a fantastic service! We are re-launching our Youth Service for 2019 with a new Health-based Youth Work Curriculum and new programme. We are looking for passionate Youth Workers to join our team and be a part of this exciting new chapter! A Senior Youth Worker, Accreditation & Transition Youth Worker & a Diabetes Youth Worker. We need your help! If you are currently accessing our service, we would love to hear from you! We are in the process of revamping our service for 2019 and would like your views. We have designed a brief survey and would be grateful if you could participate. You can click on the link below or scan the QR code with your phone. We are in the process of ‘restructuring’ our service. Please bear with us whilst we recruit and aim to get the Service bigger and better for a re-launch next year! We will still be running some of our services from the end of September – Youth Club, Youth Forum and Young Adult Group as well as a couple of trips to see the year out so keep checking our events page on the website and our Facebook page to keep updated. Donna is now back in the office (part-time for now but full-time from the end of September) so please get in touch if you want to discuss any aspect of the service or have a chat whilst our service is closed over the next few weeks. Call the office on: 0115 9709421 or contact us here. A massive thank you to everyone who took part and to those who have donated! As a team we managed to navigate and visit all 51 Stations on the NET Tram Network and take that important selfie! NUH Youth Service have been set the NET Challenge on 3rd April 2018. Members of NUH Youth Service Youth Forum are undertaking a fundraising challenge to visit all 51 Stations across the Tram Network in Nottingham, take a “Robin Hood Selfie” then off to the next station. Follow our Story on Twitter and Facebook! The Big Youth Forum Meet-up! The Big Youth Forum Meet Up! The day started early when we met at Nottingham train station to make the journey down to London. After a short walk we arrived at the venue, where there was a quick photo opportunity, as Channel 4’s Alex Brooker (comedian & presenter) was also arriving! Once all the paperwork was done, the day began with a brief introduction and question and answer session with Alex Brooker. It was great to hear about his journey, his approach to life, opportunities he’s made and why he wanted to be involved today. Oh and of course, he had the whole room full of laughter! After a brief presentation about GOSH’S Youth Forum it was onto lunch, which was a good time to mix and speak to other people about their role and involvement. The afternoon started with ‘Share and Steal’ workshops, which were one of the highlights for me. We were mixed into groups, then rotated around three different topics: – Young people’s Rights – Practical issues – Emotions and Wellbeing During these discussions we all had chance to comment on the topics and what our Youth Forums/Youth Services had done in relation. Plenty of questions were asked and we learnt from each other. The ideas were fab and plenty of ‘borrowing’ will be done I’m sure! These sessions each finished with a summary of the key points. After a quick break (the cakes were an added surprise!) to re-fuel, it was onto our chosen activity. I decided to go on the GOSH tour, which offered us the chance to see some of the facilities they had to offer and also told us some of the history of the hospital. The garden and chapel, along with the music factory were my favourites. They don’t have a Youth Service like us though! Other workshops that were on offer included CPR/basic first aid training and public speaking skills. Following another quick break it was onto the final part of the day – voting and thank-you’s/goodbyes. After a final group selfie we began our journey home, having a quick look around St Pancras before our train. The architecture was incredible! Overall it was an excellent day and I enjoyed every minute of it! It was great to meet other young people and hear about the work other Youth Forum’s had done, not forgetting to share our own experiences, ideas and NUHYS’ achievements as-well. The event was very inspiring and with young people as passionate as this, about making a positive difference, services and experiences for young people in healthcare can only get better! I can’t wait for the next one – hopefully we can be the hosts during our 20th Anniversary year! I had mixed emotions meeting up with the group to go to our annual trip to Pembrokeshire in south Wales. I felt both excited and also quite nervous. I felt very excited because I went two years ago on this residential and I know how good of a week it is! However I did also feel nervous because this year was slightly different for me as I was taking up a new role as peer mentor and I went last time as a young person. The nerves very quickly left me as I got to know this wonderful group of young people and staff! As soon as we got to Pembrokeshire we got into our rooms did our bed sheets and then we all went outside and played some games together. We gelled very quickly as a group especially as we didn’t know one another to begin with. The week was full of great memories and highlights but I am going to discuss a couple with you starting with our first full day on the Monday. This will stick in my mind for some time because of the dreadful weather and I am talking dreadful! It just didn’t stop raining! The activity we did wasn’t exactly great for this weather either… we went crabbing. I bet you are wondering now why on earth was this a highlight, well I will explain all. It’s just the fact that everyone got stuck in to the activity and had a really good go despite the awful weather we had to put up with. Everyone encouraged each other and it just showed how tight of a group we were even though we had only just met each other just 24 hours prior. After we went crabbing we went to the high ropes, already totally wet and freezing but still every young person and staff member took part. 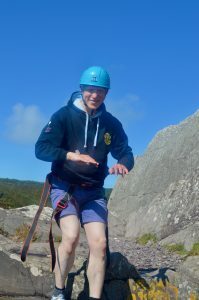 Another highlight for me was on the final day when we all went Coasteering. We always do this last because it’s the scariest, the most thrill seeking and some would argue most fun activity of the whole week. I say some would argue the most fun because I am one of those people who would argue its actually not because I am not a lover of water, I can’t swim and I am petrified of water. Again I bet you are all wondering why on earth I would say this is one of my highlights, again I will explain. Everyone supported each other throughout the activity and stuck together as one big team. A couple of us who couldn’t swim and this included me, held each other’s hands for support. The instructors were incredible! They reassured us that the equipment we had would do its job and it didn’t matter that we couldn’t swim. I promise you if it wasn’t for this group of people I wouldn’t have taken part in this activity on the two occasions that I have been on this residential. The final highlight I am going to share with you is every single night we spent together. At about eight o clock we would all gather together in one of the buildings that we stayed in. We named this building the white house, you guessed it because it was white! We played games together that included Uno, Poker and Dobble. It was so lovely and it just felt like we were one big family. There was a tuck shop available to get drinks, sweets and chocolate from, so yes the essentials! We also some nights had a film on which was nice after a long day Kayaking, Canoeing or getting wet!! My favourite day overall was Wednesday this was when we went to the smallest city in Europe St David’s. It was such a wonderful day! We went on speed boat for a wildlife boat trip. It was so much fun! The speed boat going over the waves was the feeling you have when you go on a roller-coaster at Alton Towers. Also we saw some beautiful wildlife! We saw some seals which were just the cutest and when you live far from the sea, it made it even more incredible! After the speed boat we all went onto St David’s were we walked around in little groups. We had a look around the Cathedral which was beautiful and we had a look around the local shops were most people brought gifts to take home. We then ended the day with an ice cream which is tradition and I can’t describe to you how tasty that was! Although I’ve only touched on a couple of the activities we did over the week they were all equally as fun. Activities this week included crabbing, high ropes, Climbing/Abseiling and Bouldering, surfing, and Wildlife boat tour, Kayaking / Canoeing and Coastering. Overall this has been an extremely positive experience for me; It was a great chance to experience a residential as a peer mentor. Not only did I get to experience all the activities again for the second time (very fortunate I know) but I also got to see all the young people experience the activities too and for some of the young people it was their first time. The young people looked like they really enjoyed the week and I enjoyed seeing them gain confidence from all of the challenges they overcame and new experiences they had during their week, It was great to encourage them and I hoped I helped. I really hope I get the opportunity to experience this again in the future! Roll on next year! I have been on work experience with the NUH Youth Service all this week. The things I have been doing are ward rounds, where we visit young people at their bedside, answering phone calls, helping run activities at the weekly Youth Club, daily drop-in sessions and the YAG (Young Adult Group). On Tuesday me and Terrence met some young people (receiving dialisys treatment) we were talking about the video that we made on the youth forum residential last weekend. On the Wednesday me and Mark did a presentation [to Nursing Associates] on a brief history about the NUH Youth Service and about what we do and what kind of projects and what qulafictions we do. On Thursday I did admin work and my teacher Miss Hatch came too see how I was doing. After that I made a few phone calls and sent a few emails, then orded a few resources ready for the summer programme. Friday (today) we had YAG (Young Adult Group) where we spoke about the coffee project they have been working on. Then in the afternoon me and Terrance met a young person receiving treatment (dialysis). Then it was back to the Youth Room to run the final drop-in session of the week before heading home! The things that I have enjoyed the most this week are: ward rounds, seeing what happens behind the scenes, and doing what my I love for a week. 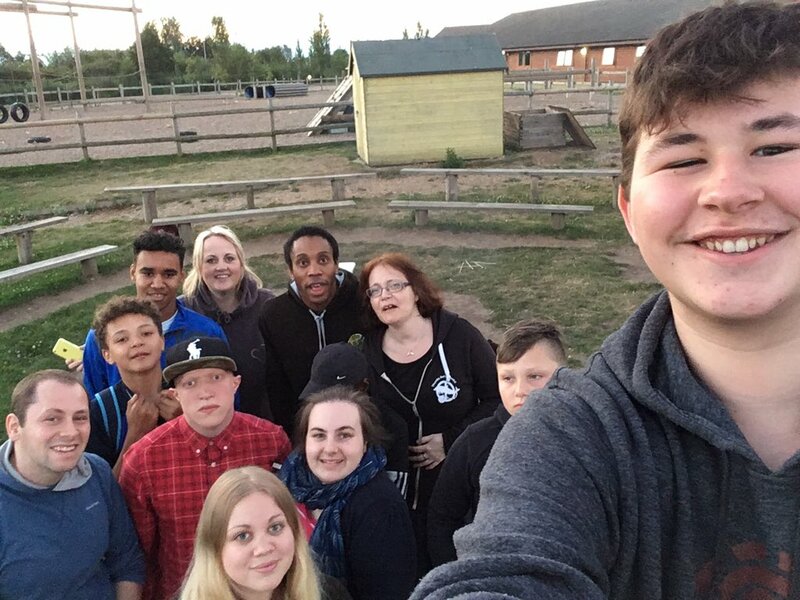 Ben (at the front) taking a selfie on the recent Youth Forum Residential!